When your child has a medical emergency, you want them to get the care they need as quickly as possible. That's why the Emergency Department at Rancho Springs Medical Center has pediatric emergency medicine physicians from Rady Children's Hospital in San Diego on site seven days per week from 7 a.m. to midnight (outside of these hours, pediatric patients are seen by Rancho Springs Emergency Medicine physicians). Pediatric emergency physicians are sensitive to the needs of kids and take a different approach to care. By incorporating games, toys, focused attention and kid-friendly communication, pediatric specialists, along with emergency-trained nurses and staff, put kids at ease so they can be more receptive to procedures and treatment, such as pain management. Pediatric emergency specialists also know how to use medical tools and equipment that’s adjusted to fit your child’s size. 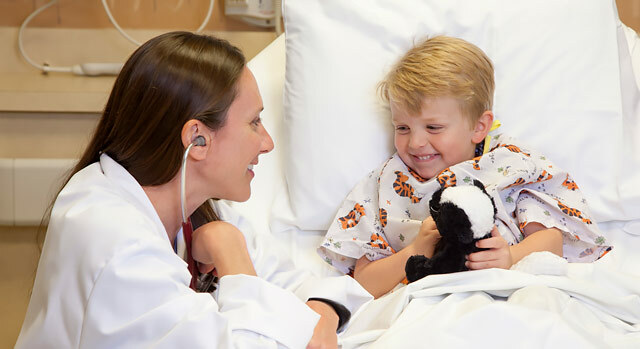 If your child must be admitted to the hospital, their physician can easily arrange to have them transferred to Rady Children’s Hospital for the specialty care they need. If you need a referral to a pediatrician or other physician at Rancho Springs Medical Center, call our free physician referral service at 1-800-879-1020.